Hilton Head-Savannah: The Golfweek Amateur Tour hosted a 47 player tournament at Savannah Harbor on Saturday. In The Championship Flight Randy Sparks edge out three other players by two shots for his first victory of the 2018 season. Sparks posted a 74 followed Dennis McCormac, Turner Wegener and Terry Lanning all at 76. Chance Carrick and Jake Garey rounded out the top five with 77. In the A Flight John Gilbert from Savannah was victorious with an 83 followed by John Camus and Joe McVey at 85. Bob Potter from Charleston was solo fourth at 86. In The B Flight Paul McGee took home the victory with 83 followed by George Bursey at 85. Todd Saylor was solo third with 86 and newcomer Jimmie Woods and Scott Ammons tied at 88. In the C Flight Mathew Nemes wins by two shots at 85 followed by Travis Carlisle at 87. Noel Coolican and Lyn Rhode both tied third with scores of 88. In the D Flight Mike Casazza and Aaron Masterson tied for first place with 96 but as darkness fell we did not have time have a sudden-death playoff. 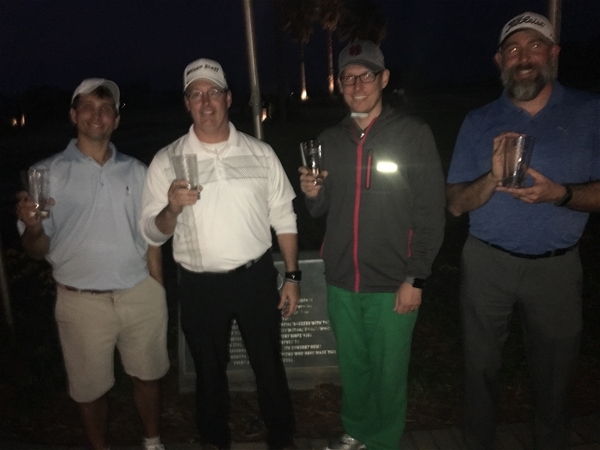 Casazza was victorious as the Golfweek tour rules states when we can’t go back out on the course we go to a scorecard playoff which Casazza won. Mike Flanigan was solo third with 97 and Lee Tincher finished fourth at 99.